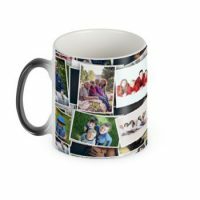 Want to make a beautiful personalised gift for a loved one, but only have a limited number of photos? Trying to make something with all of your family memories but can’t quite decide on which snaps are your favourite? Fret no more! 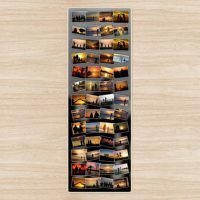 We have a wide number of photo collage ideas for a huge range of image numbers. Have a look through our little guide below to find out which ideas suit your photos the best! If you want to see how to make a photo collage, check out our step-by-step guide. The more pictures you add to a design the smaller your images will be. Imagine you have an A4 photo collage, 2 pictures, split down the middle. They will be quite big images. Plenty of detail, people appear large, and you can see into the distance. Now imagine a 30 photo collage on that same piece of paper. You’ll be able to see who the picture is of. But you’ll probably lose the details, you won’t be able to pick out glasses, buildings in the background, possibly not even the images on people’s t-shirts. 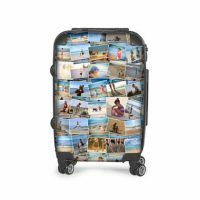 With 30 images on one page, that are each of a single person, you’ll be able to see them more clearly than 30 snaps of a family of four. The right number of images to use isn’t a simple answer. It changes on a case by case basis, dependant on the quality of the images, what they’re of, and a number of other factors. We can’t tell you what the right answer is, but we can certainly give you some guidance, and a few photo collage ideas. A good rule of thumb, is to make sure that each of your images is around 10 centimetres wide when in landscape. That will be 10 centimetres high if it is in portrait orientation. This might seem like it would be tricky to calculate. But that’s where we come in. A lot of our products will give you measurements within the product description. 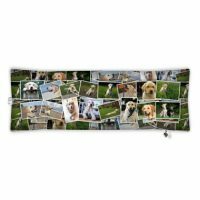 If you’re ordering something which is 1 metre wide by half a metre high, and you know that all of your images are landscape, about twice as wide as they are high, you can estimate that you would be able to make a 100 photo collage, or there about. Another handy way to work out the number of images is within our design tool itself. On the left hand side, once you have added your images, you will see that your item is surrounded by a ruler. 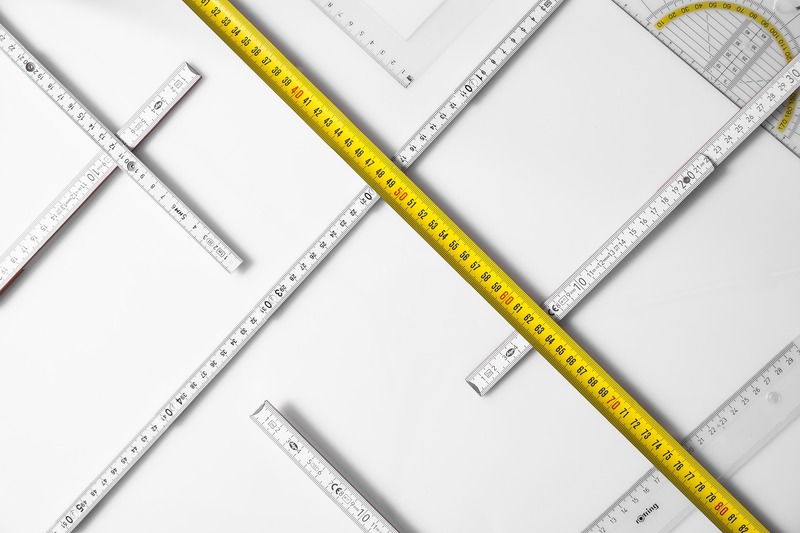 You can use this to make sure that your photos are approximately 10 centimetres on their longest side. 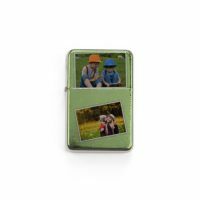 Smaller products are ideal for making a photo collage, 2 images and either a coloured background, or one of your photos. 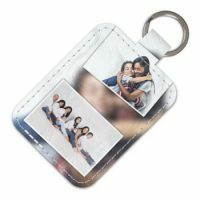 Check out this lighter and key ring which show this. Great for stocking fillers, and small “I’m thinking of you” gifts. For collages with 3 photos on them, again choose smaller products. 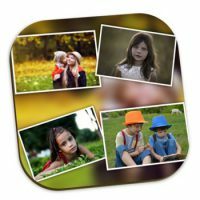 Choose your favourite snaps to make a great 3 photo collage. Aluminium prints with multiple images are great for those with siblings or children. 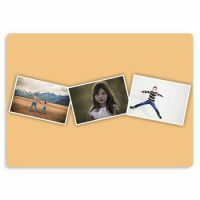 Phone cases and coasters are brilliant photo collage ideas for 4 photos, you can display them in a grid or in a line. 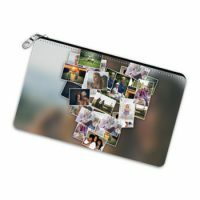 Create your own 4 photo collage – perfect for personalising your life, whether it be your living space or your pocket. A 6 photo collage looks really effective when in a line, whether horizontal or vertical. 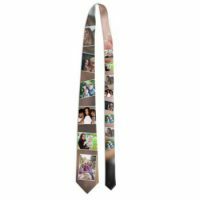 Check out this tie, which makes a perfect present for that new dad who’s just going back to work. 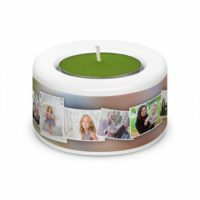 This tealight holder which shows 6 images wrapped around it. 9 photo collage images work brilliantly on square products. Check out this acrylic block and square clock. You aren’t limited to square items but it does give an effective, stylish result, whether you’re customising the kitchen, or decorating your desk. When you have a middling number of photos, look for a little more surface area. 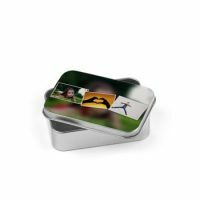 Make a 10 photo collage with our heat changing mug or make up bag. The heat changing mug will look plain blue or black until you make yourself a hot cuppa. 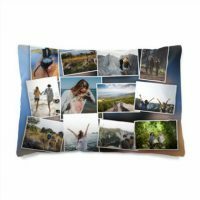 A 12 photo collage is the perfect size for things like tea towels and pillow cases. 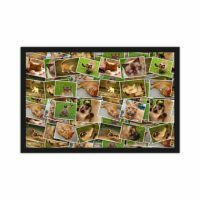 The pictures can be displayed in so many different ways but look brilliant in a grid as it gives you three lines of four photos. The perfect housewarming gift for that couple who seem to already have it all. 16 photo collage ideas are brilliant for those mid-sized products. This doormat and bolster cushion are great examples. At this point you have enough photos that you can begin to successfully use the scatter montage, however you may find that some images are repeated. Great for new homes, or even just to treat yourself during the spring cleaning. With a bigger surface area you can start to use many more photos. 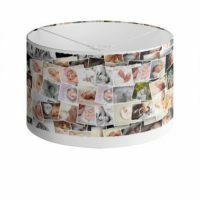 Check out these with 18 photos, collage ideas using personalised leggings or a guestbook. Wear your own favourite photos with pride with personalised leggings. A photo guestbook makes a great gift for a weddnig, as it allows all the guests to leave wonderful comments about the happy day. 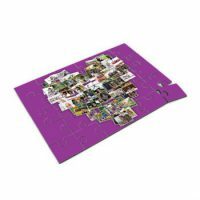 With a 20 photo collage you can use a number of the collage effects, from the pre-set heart shape to a grid of images. Products with larger surface areas look much better with this amount of images as they are all a good size and can be seen more clearly. 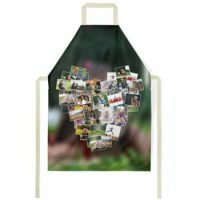 Aprons are fantastic all year round, from summer barbecues, to baking cakes through the winter months, and what better to serve up those delicious treats that on a personalised photo tray. 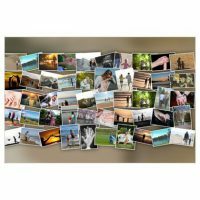 30 photo collage prints work well in a variety of shapes. 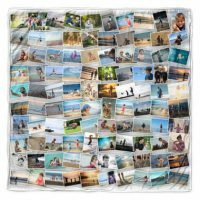 This kid’s towel and photo jigsaw each use 30 fantastic photos. 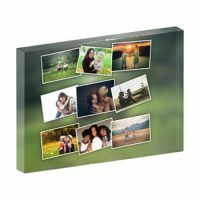 Both products are available in a variety of sizes, so you can easily change the number of pictures you use. Tailor for the recipient, whether it’s the kids or the grandparents. A 40 photo collage needs an appropriate sized canvas. This suitcase is perfect, and it means you’ll never worry about which case is yours. Another great alternative is a lampshade. We’d advise use for a lamp rather than a ceiling light, as pictures you might not be able to see so many pictures clearly from that far away. The more images you have, the bigger the product you’ll need. This yoga mat, or flag are great 50 photo collage ideas. They have a large surface area which is great for a montage with multiple images. Both are great gifts for those outdoorsy friends. 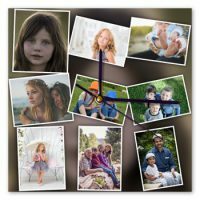 Whether they are running a marathon, doing their daily yoga, meditating or marching, you can make a photo collage on the perfect gift for them. A 60 photo collage needs a much bigger canvas. 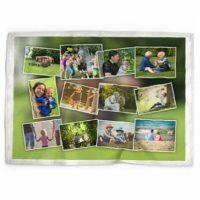 This double layer fleece blanket is perfect for a large number of images, and you can even print on both sides if you want to. 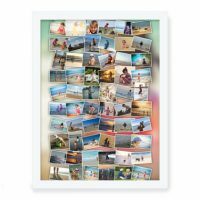 This framed print is available in various sizes up to 24 x 36 inches, so you can play around with the number of snaps you use. These make great commemorative gifts, for new born children, milestone birthdays and even weddings and christenings. 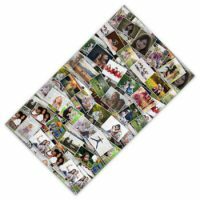 You can even make a grand 100 photo collage if you use a product that is big enough for your base. 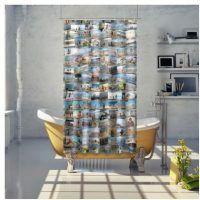 This shower curtain or throw is a great idea, as it gives you hours of looking at your favourite memories. There is so much variety available, that whether you’re snuggling up on the sofa, or freshening up in the bathroom, you can look at these memories and reminisce your way to your happy place. 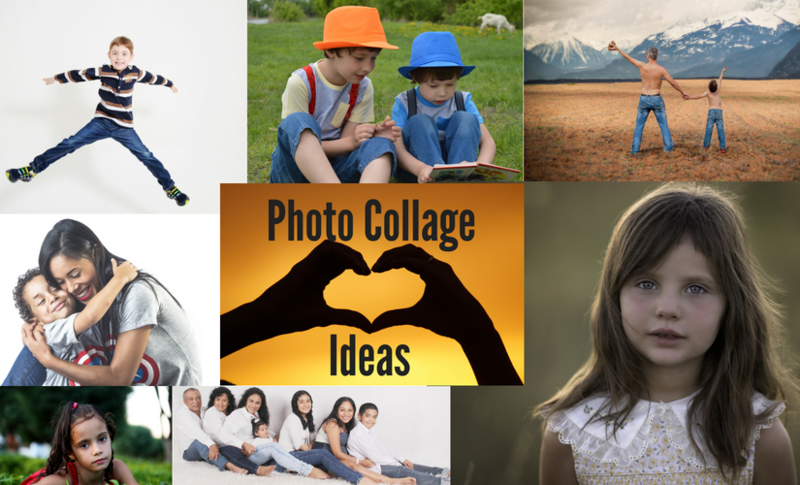 Now you have some great photo collage ideas, why don’t you try making your own photo collage? 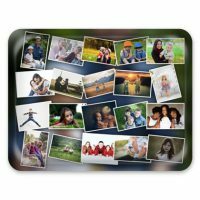 Whether you try one of these ideas, or it has inspired you to make something different, you can create your own photo montage items in no time! World Cup 2014 – Show Your Support! What a lovely idea. Collages can make a wonderful gift that can e so personal and show so many happy memories. Along the same lines, i have found an app for Instagram recently that allows you to make collages from your pictures so easily ( i do not work for this company i must add, just use there app ). Its called layout and is so easy to use. Worth a look in time for our Christmas family posts.